Tagkast's opt-in capture service gathers data during the e-mail retrieval process. Handraiser leads can be embedded directly into the sharing process or used independently. By utilizing CRM integration, the information captured can be easily downloaded from the portal and synced to you. Finally, you can collect Facebook Page likes and Twitter followers directly from your events to further grow the size of your online communities. 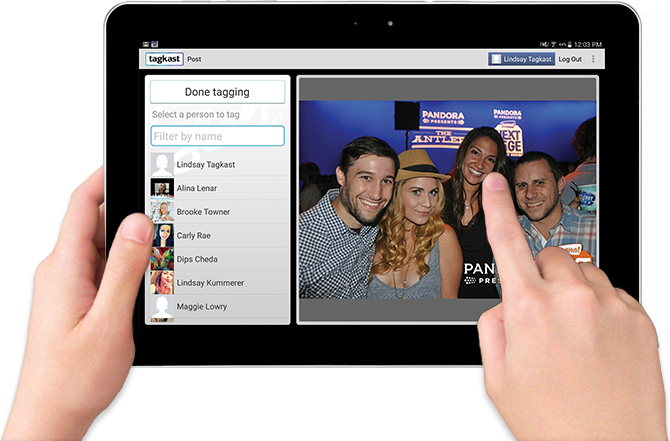 Tagkast provides sophisticated audience and digital engagement metrics, allowing you to track interaction with the brand content shared through our app. Data-driven decision making is more important than ever. The Admin Portal tracks both event and Tagkast operator performance and allows you to remote monitor in real-time. Get a detailed look at single events as well as a more comprehensive view of multiple compaigns, allowing you to optimize your ROI in multiple ways.